Check out the previous posts in the series here, here, and here! 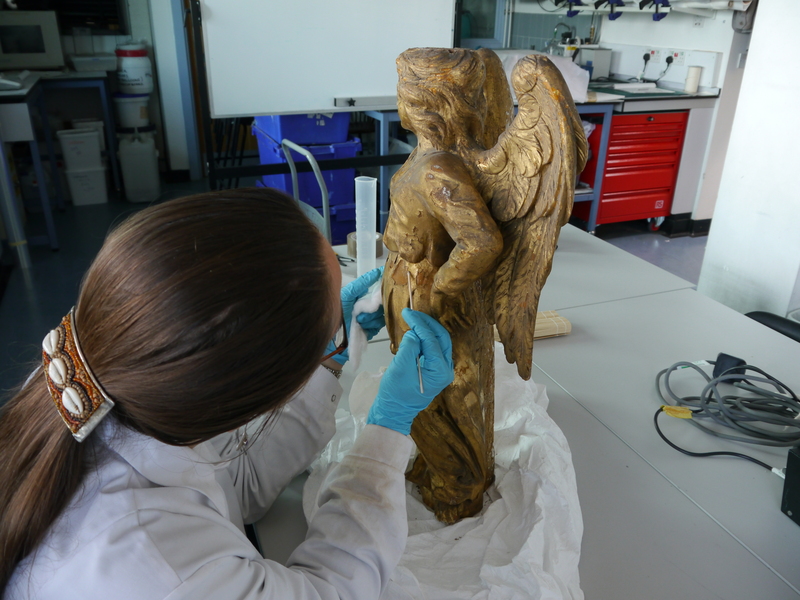 Our last blog post on the treatment of the Norfolk Museums Services angels dealt with some very satisfying flake relaying on Angel A. 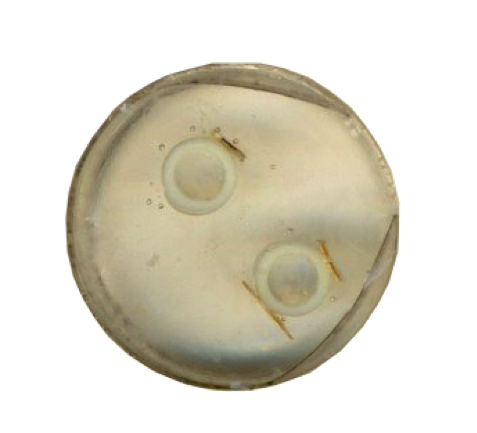 In this new episode, we shall delve into the treatment of Angel B (shown below in case your memory needs jogging), which had suffered a more severe case of surface delamination than its counterpart. 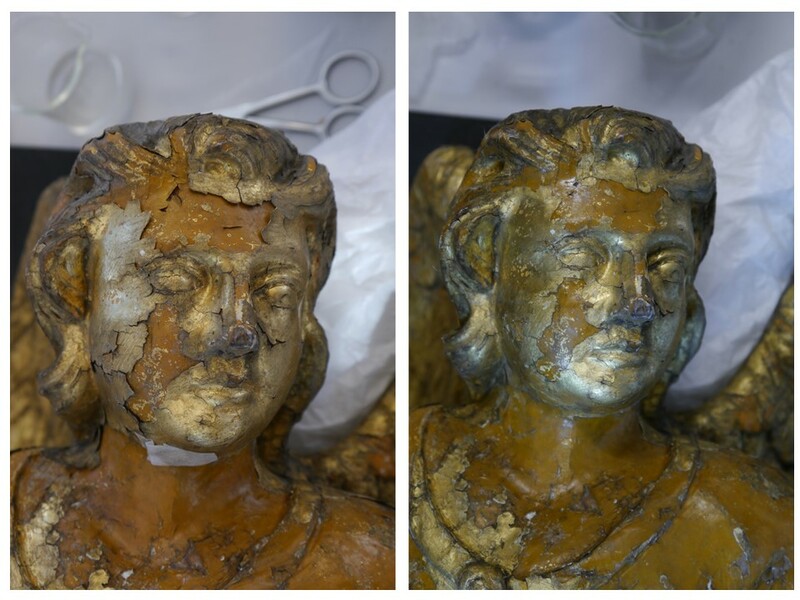 Indeed, the delamination had reached such a severe state that even slights movements of the angel within its packaging resulted in notable loss of gilding! Angel B, more affectionately known as Gabrielle. Courtesy of Norfolk Museums Service, T1878333. 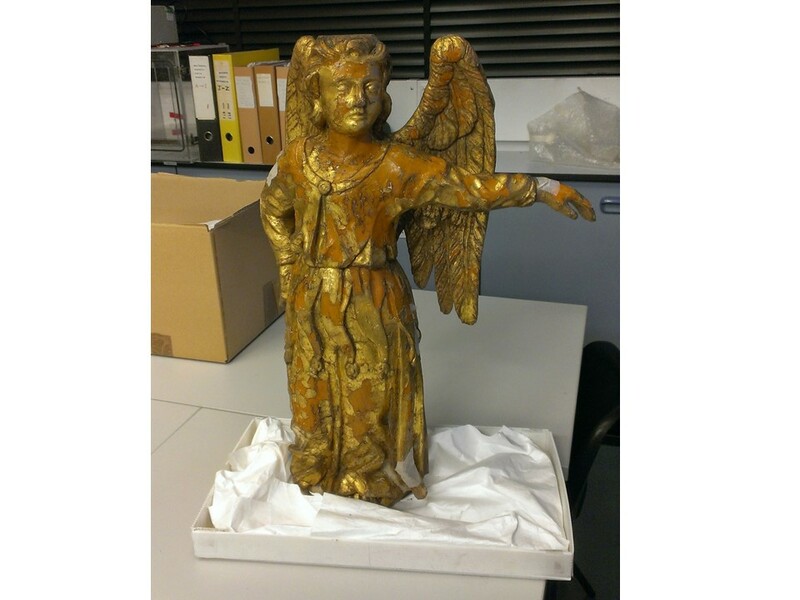 For this reason, an intensive rescue operation took place earlier this year over three, wintery January days, with the aim of stabilizing the angel so that it may be removed from its packaging and be treated in a similar manner as Angel A. 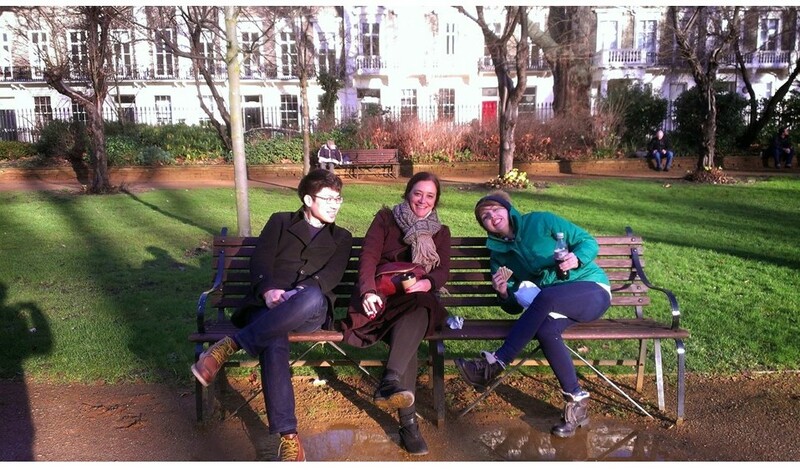 An enthusiastic team comprising of the author, Letty Steer and Dae-Young Yoo was put together and led by a motivating Claire D’Izarny-Gargas. The team members hard at work – above, from left to right, Dae-Young Yoo, Letty Steer & Claire D’Izarny-Gargas; below, from left to right, Jan Cutajar, Dae-Young & Letty. Given the condition of the angel, it was slightly (if not very!) daunting to actually even consider touching the angel. The first step, therefore, was to develop a method of stabilising very loose flakes. After several initial trials, it was found that the best method, given the time frame we had to work in, was to apply a Japanese tissue paper facing (adhered directly with a 2% w/v solution of Klucel G in isopropanol, a hydroxypropyl cellulose adhesive commonly used with organic materials), which was then heat-activated using the heated spatula. This step allowed the gilding flakes to be slightly re-shaped in the process before relaying. You can see these facings in the pictures above – here are some more detailed shots of the procedure. Applying the Japanese tissue facing using 2% w/v Klucel G – where possible, the areas of flaking were cleaned first, as can be seen. Sometimes though, this was not possible and facing was applied directly to severely flaking sections. The same procedure used to relay flakes on Angel A was then used, applying solutions and heating through the paper facing, which was possible due its fibre-thin nature. 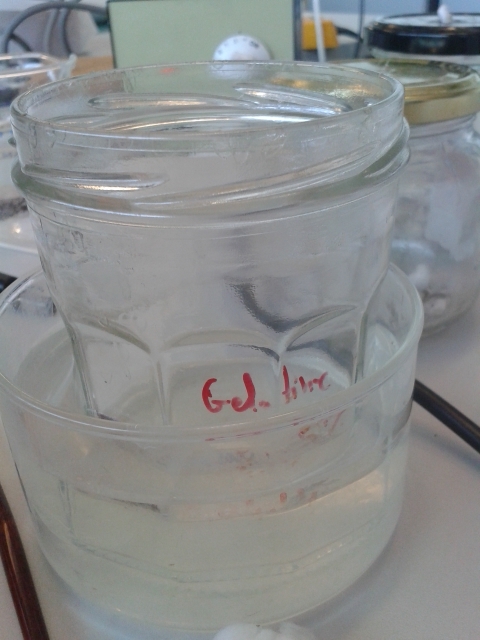 Once the gelatin (5% w/v in deionised water) had set hard after 5–10 minutes from heat-activation, the facing was removed by first moistening it with lukewarm deionised water and then peeling it off at a 180o angle with a pair of pointed tweezers. Any clean-up of excess gelatin or paper threads could then take place with warm water swabs. Here’s an example of the complete treatment procedure: (1) flakes before treatment; (2) facing applied; (3) application of 50% IMS and gelatin, followed by heat activation; (4) after setting, the facing is removed with a warm, wet swab; (5) tweezers are used to pull the facing gently off; (6) the area after treatment, success! Once we were confident that this method worked, the angel in its packaging was set on the operating table and the areas identified as most fragile were faced and treated. There definitely was a ‘surgical theatre feel’ to all this, with two conservators each working on each side of the box, passing around spatulae, brushes and adhesive solutions. Everyone fell promptly into their roles and the rhythm of work got going. 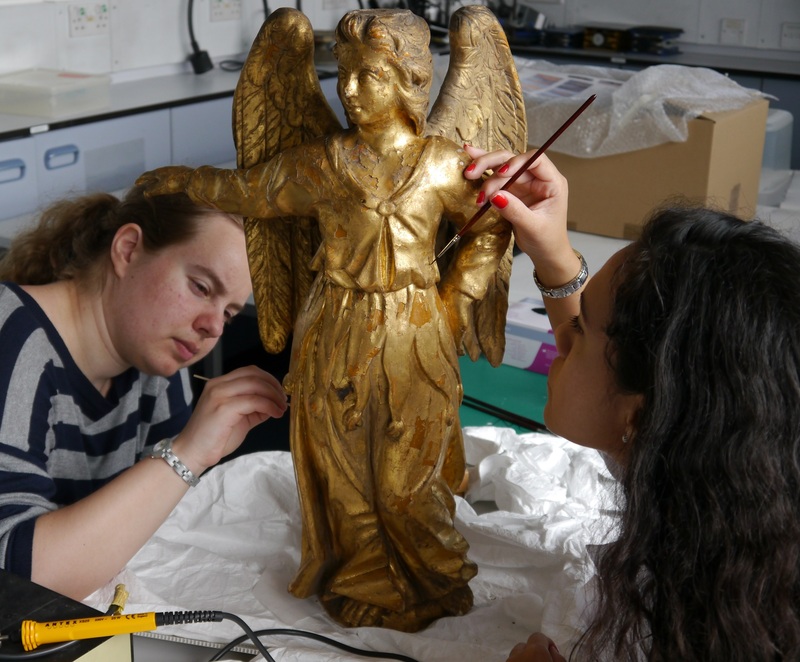 Here, Claire and Dae-Young are stabilising the angel, before its removal from its temporary packaging. The “operating table” so to speak, with different parts of the treatment taking place at the same time. 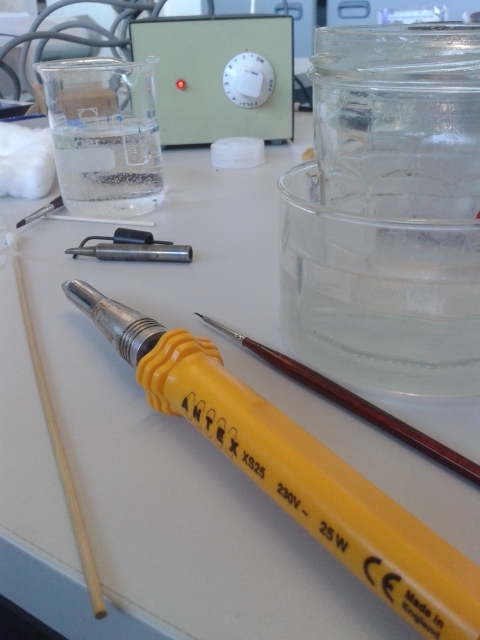 Letty and Young heat activating the Klucel G and gelatin using heated spatulae. 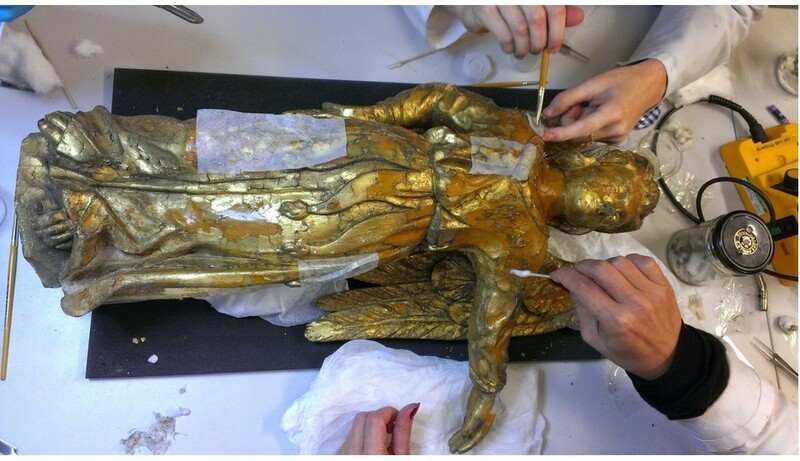 After the first day, the angel was lifted out of its box successfully without any severe loss of gilding. This allowed us to access more surface area on the angel and so the work intensified during the next two consecutive days, as you have seen already in some of the photos. Facings were applied, flakes were relayed and facings taken off. The most challenging areas were the face, wings, chest and feet on the angel due to the undulating surfaces and level of decorative carving. At times, some flakes were broken or damaged during treatment which was heart-wrenching, however, the solution to this was very straightforward: document it and then repair it. Some stunning work achieved by Claire on the face of the angel. Similar successes on the left wing – clearing the facing was particularly tricky here, as it tended to catch on the decorative carvings, lots of care and caution were thus necessary to achieve these results! At the expiry of the available time, the angel was miraculously looking in much better shape than before, and in turn was also much more stable! Indeed, the success of the treatment allowed us to move the angle from a lying, horizontal position to a standing, vertical one. Advantageously, this then permitted an improved packaging solution to be implemented whilst more work was carried out at a later stage. The angel after three days solid work – and finally standing whole! Yes, despite the advances made at this stage, the treatment was not yet over and further relaying of gilding and paint was necessary. This was completed in part during another similar session in February. In fact, should you wish to know about this session, we will be more than happy to answer your questions in person at this World Archaeology Day Festival at the UCL Institute of Archaeology, come Saturday the 13th June! There’s an even more exciting part though! 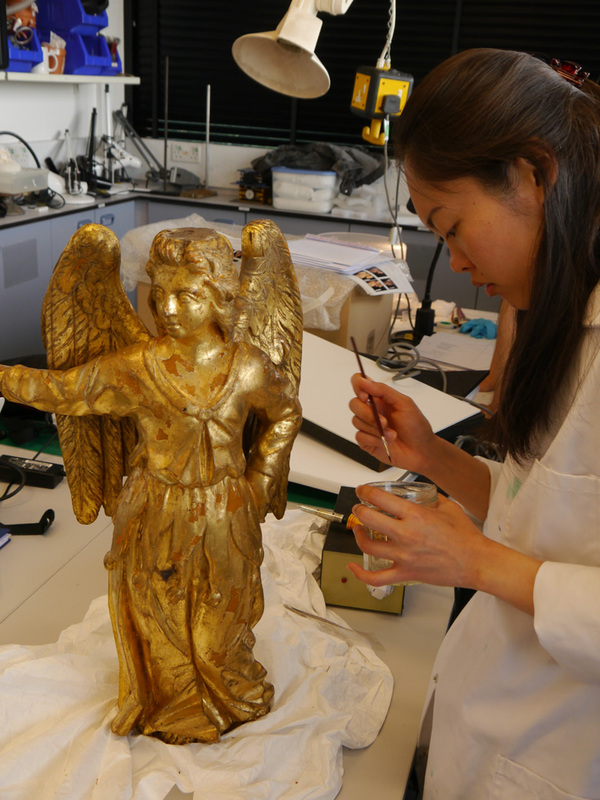 We shall be working on the angels this Saturday and you will have the opportunity to see how this work is done in real-time. So don’t miss out on this fantastic opportunity to set your eyes on these angelic beauties, we look forward to seeing you! N.B. All photos by Claire D’Izarny-Gargas & Jan Dariusz Cutajar. Permission to post courtesy of the Norfolk Museums Service. Following the research conducted by Claire d’Izarny-Gargas, further examination led to the formation of treatment plans for Angel A and Angel B. As discussed earlier, Angel A was in decidedly better condition, so it was tackled first. 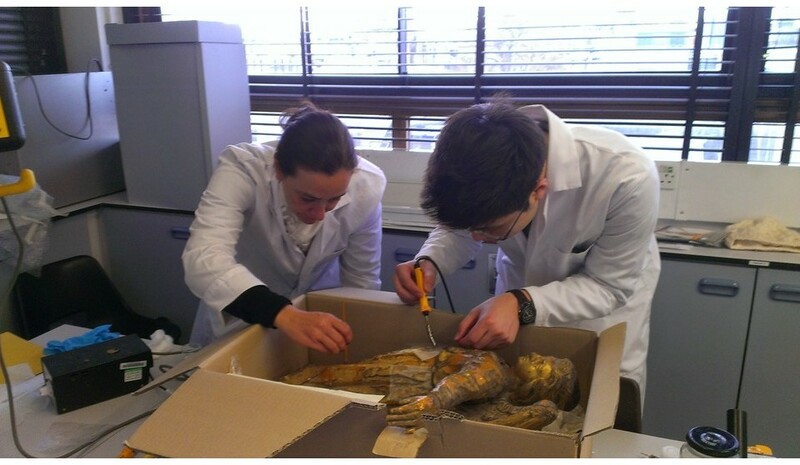 Claire starting the treatment on Angel A, courtesy of Norfolk Museums Service, T1878333. 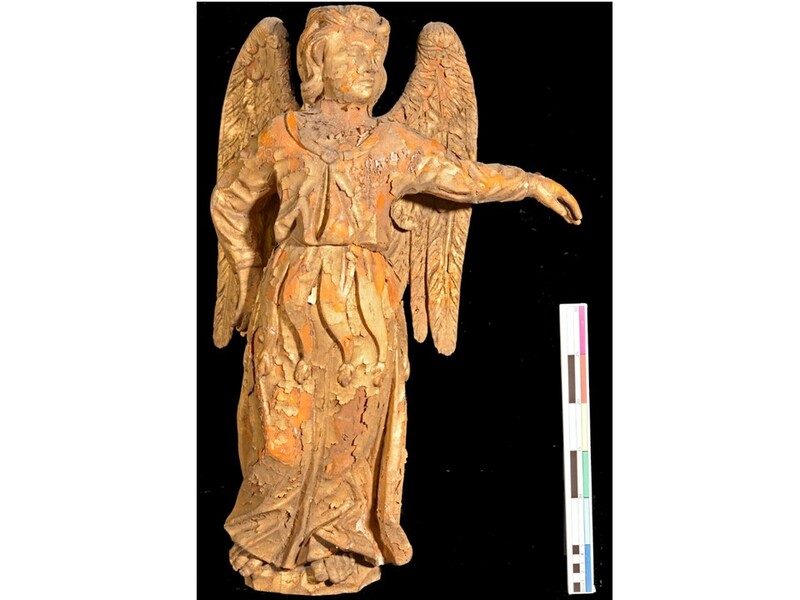 On the front and the back of the angel were two different types of surfaces. The front was a gilded layer, which was flaking and delaminating. The back featured a painted layer, also undergoing flaking, but not as extensively. The front and the back of Angel A therefore underwent different treatments. 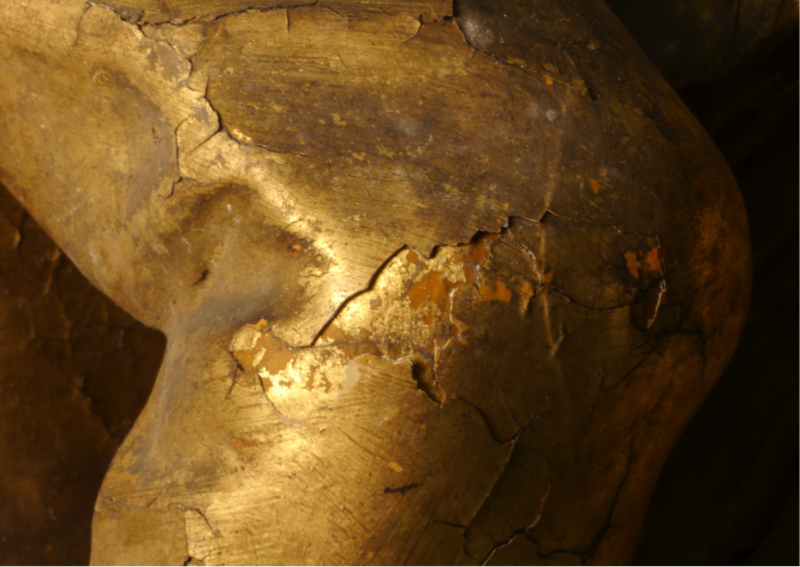 This blog post discusses the relaying of the flaking gilded surface. For the front of the angel the main goals were to clean the surface (which was very, very dirty!) and to relay the remaining flakes. An initial gentle clean was done with a cotton wool swab and a solution of 50:50 IMS (industrial methylated spirit) and deionised water. This method was selected after some cleaning tests were carried out in an inconspicuous area. Cleaning tests on Angel A. Courtesy of Norfolk Museums Service, T1878333. The flakes were then relayed by first saturating the area with the 50:50 IMS/ deionised water solution. Then, using a small brush, a drop of warmed gelatin solution (5% w/v in deionised water) was placed under the flake. Saturating the area first reduced the surface tension and allowed the gelatin to penetrate under the flake. After the gelatin cooled a bit (a few minutes), heat was applied to the area with a heated spatula. A piece of silicone-release paper was used between the spatula and the angel, to prevent damage to the surface from the tackiness of the gelatin. Pressure was gently applied to the flake with the heated spatula, in a ‘rubbing’ motion. The gradual heating softened the gilding and allowed it to be re-shaped onto the surface of the angel. The heat ‘activated’ the gelatin and adhered the flake onto the substrate. This method was very successful in relaying the flakes with little breakage. Following re-laying, further cleaning could be done without risking additional damage to the surface. The left hand of Angel A before and after the flake relaying. Courtesy of Norfolk Museums Service, T1878333. The bulk of this treatment took place during the summer months of 2014 and allowed for the involvement of both MSc and MA conservation students – a great opportunity to work together and learn from one another! Erin Murphy using the heat spatula to gently press down a flake and seal it with the gelatin. Courtesy of Norfolk Museums Service, T1878333. Rachel Altpeter and Romina Quijano Quinones working together. Courtesy of Norfolk Museums Service, T1878333. Yuqi Chock applying gelatin to flaking areas of gilding. Courtesy of Norfolk Museums Service, T1878333. Photographs by A.Duckor and Claire D’Izarny-Gargas. Back to the stunning pair of Angels from Blo Norton Hall Chapel – see the first post in the series here. Angel A (right), and B (left). Courtesy of Norfolk Museums Service, T1878333. 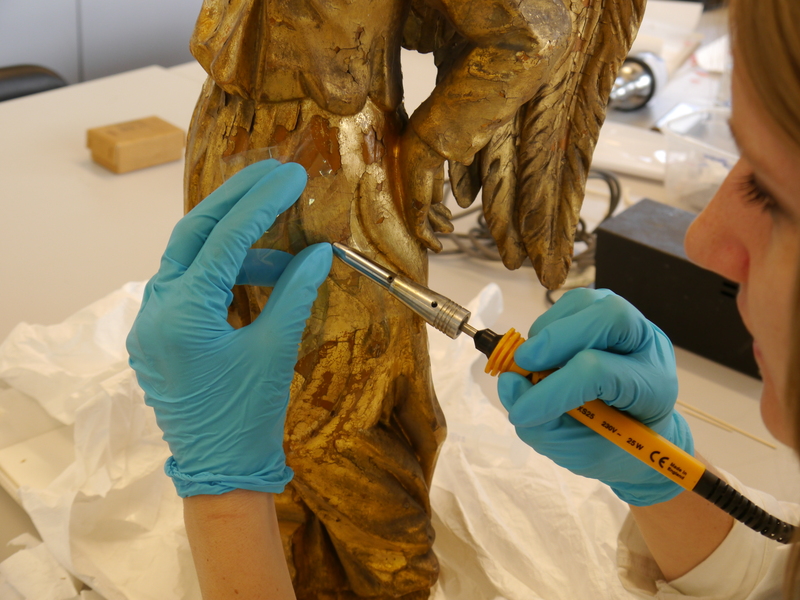 Before proposing a suitable conservation treatment for the Angels, we needed to better understand how they had been made and the causes of the dramatic flaking of the gilded layers on both Angels. 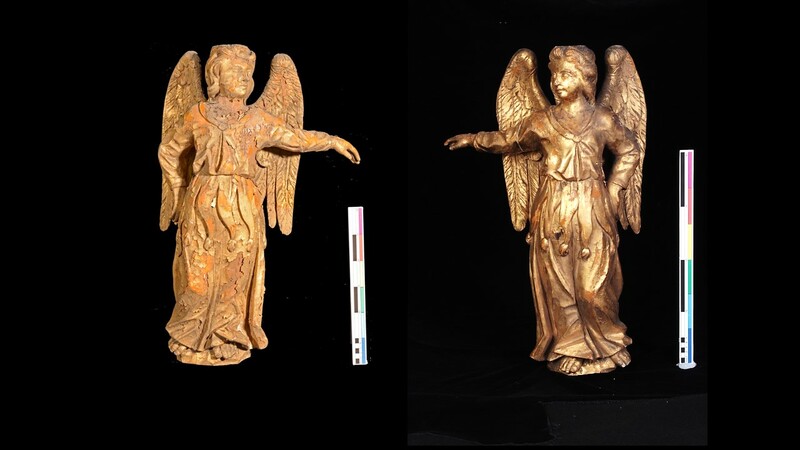 An initial examination showed that they were covered by several layers of gilding and that the detachment of the surface appeared to be at the same layer on each of the Angels, revealing the mordant of an older gilding layer. 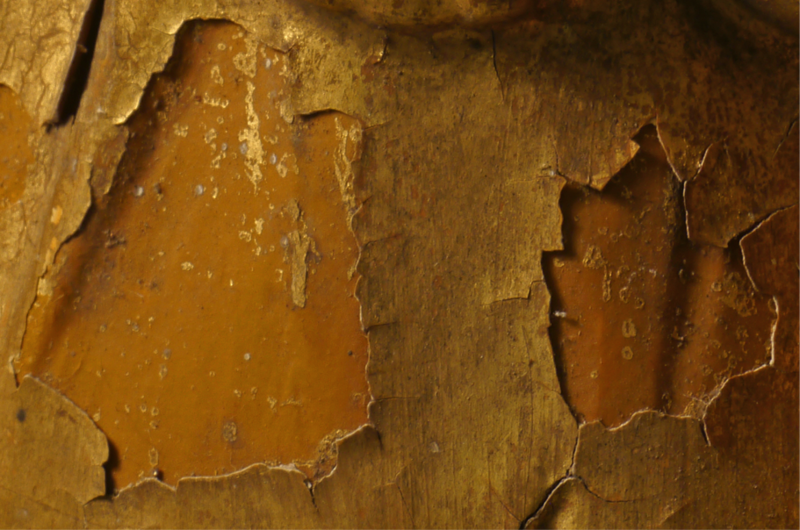 The high degree of damage and the shiny/waxy appearance of the uncovered mordant suggested that some change had occurred between the two gilded layers, causing the detachment of the outer gilded layer. It also appeared that the mordant was composed of wax, rather than animal glue, which is a more commonly used gilding technique. Further analysis could help to confirm this, and would give a better understanding of the composition of the successive layers added to the surface, and an idea of the type of gold used – was it pure gold leaf or an alloy? Detail showing two gilded layers on the arm of Angel A. Courtesy of Norfolk Museums Service, T1878333. Detail showing the yellow ‘waxy’ mordant on the dress of Angel A. Courtesy of Norfolk Museums Service, T1878333. 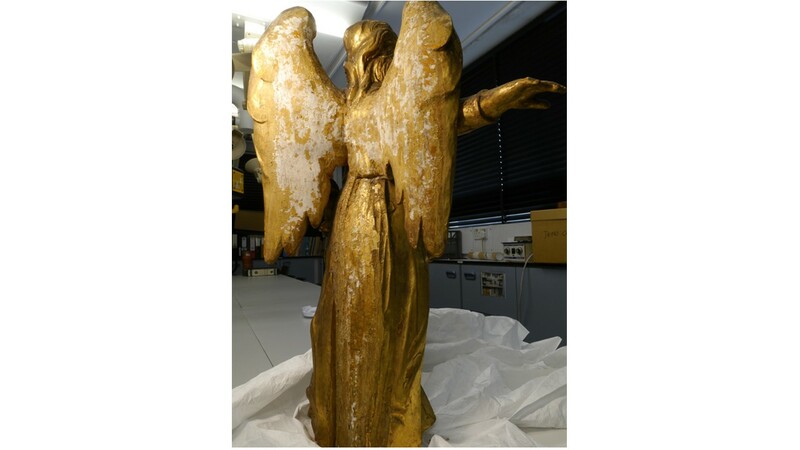 Angel A was investigated by using a combination of techniques, such as micro-chemical spot testing of samples (flakes which had fallen off the statue), Fourier transform infrared (FTIR) spectroscopy, observation under ultra violet (UV) fluorescent light, thermo-microscopy and analytical studies of two cross-sections under the polarised light microscope (PLM) and scanning electron microscopy with energy dispersive x-ray spectrometry (SEM-EDS). Each of these analytical techniques enables us to characterise the materiality of the object with different degrees of accuracy. Correlating the results of the different analytical techniques would help us determine how the Angels had been made. In this post we will talk specifically about the polarised light microscope (PLM) and the scanning electron microscopy with energy dispersive x-ray spectrometry (SEM-EDS), which are two amazing techniques that, when combined, allow us to get accurate results. 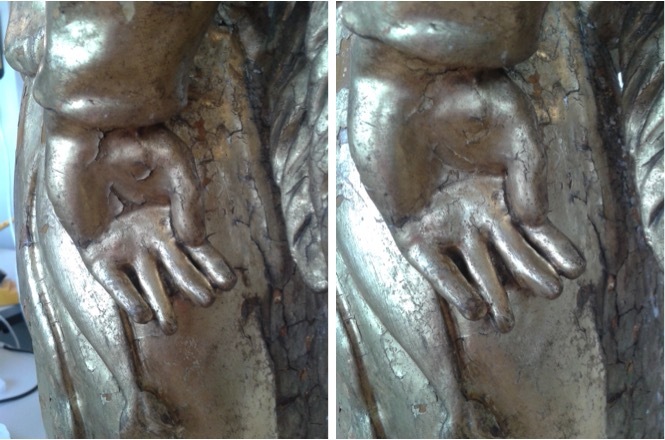 Two samples, taken from different areas of the statue, were prepared in cross-section. The cross-sections were first embedded in a resin and observed under a polarised light microscope. 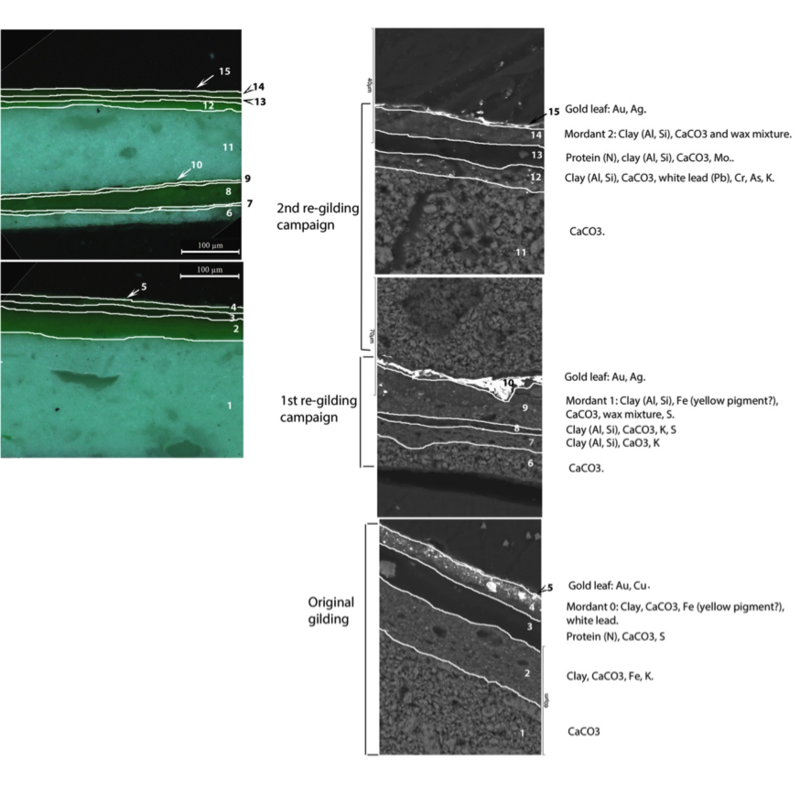 Two samples of the gilded layers taken from Angel A were embedded in a resin to realise a cross section, which will then be observed under the PLM and the SEM-EDS. The PLM gives precise information about the thickness and the number of layers present in the polychrome surface. 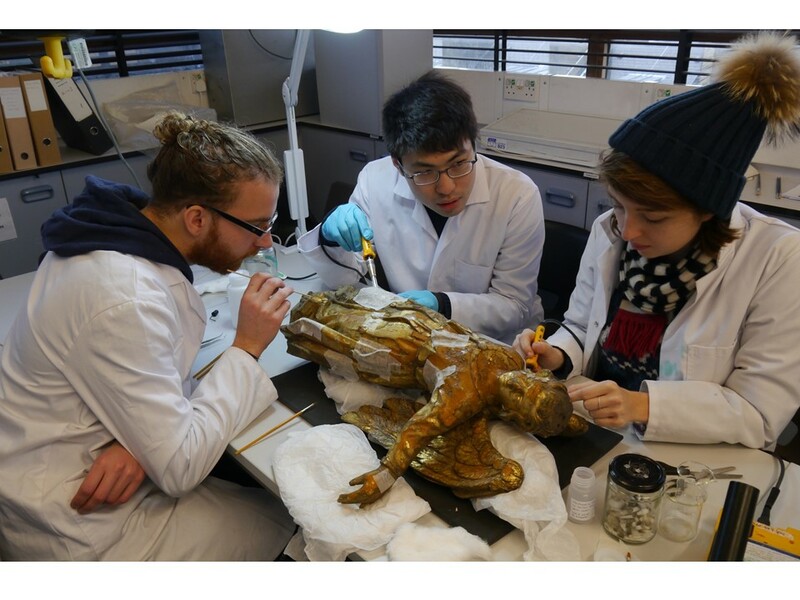 Moreover, it is possible to identify the number of gilding layers and so to give the number of gilding campaigns carried out on the statue. The use of the SEM means that the morphology of each layer can be studied under higher magnification than with PLM. Also, the EDS can provide an elemental analysis of the sample and therefore identify and precisely locate the inorganic elements present in each layer. The investigation revealed the presence of three gilding layers, each composed of five distinctive layers. The gold leaf layer was made of gold alloy of copper and silver. The fillers were made of calcium carbonate, which was occasionally found mixed with clay. Furthermore, the presence of wax in the two mordant gilding was confirmed, mixed with an unknown component. Finally, the use of white lead pigment was identified alongside iron oxide. 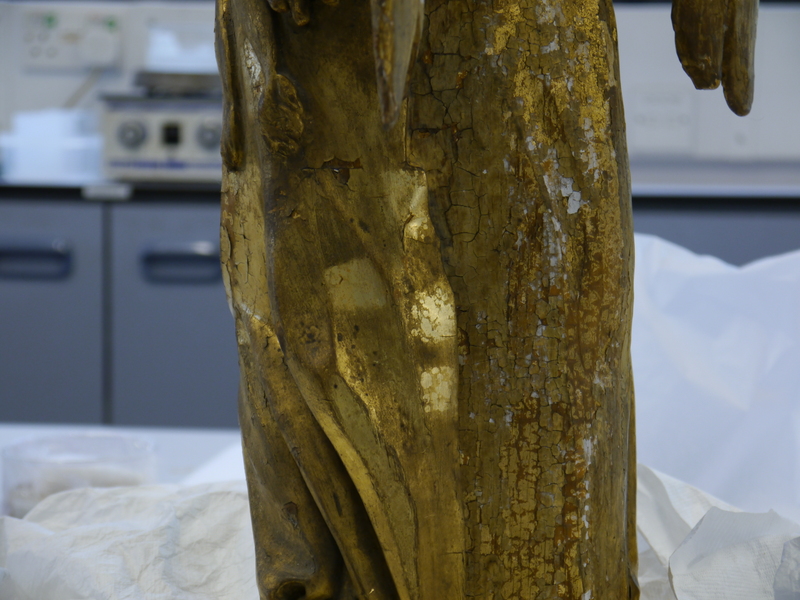 The difficulty of adhering gold leaf to a wax surface, combined with fluctuating environmental conditions over long periods of time could have been the reason for the extensive detachment at this level. Forget Shaggy and that catchy tune, drum-roll on cue, allow us to introduce you to two fascinating objects, straight from heaven above. Ladies and gentlemen, we present to you Gabriel and Gabrielle (blandly named Angel A (right) and B (left) respectively). Courtesy of Norfolk Museums Service, T1878333. Well, more precisely, this stunning pair of wooden gilded statues is originally from Blo Norton Hall Chapel in the Breckland district of Norfolk. 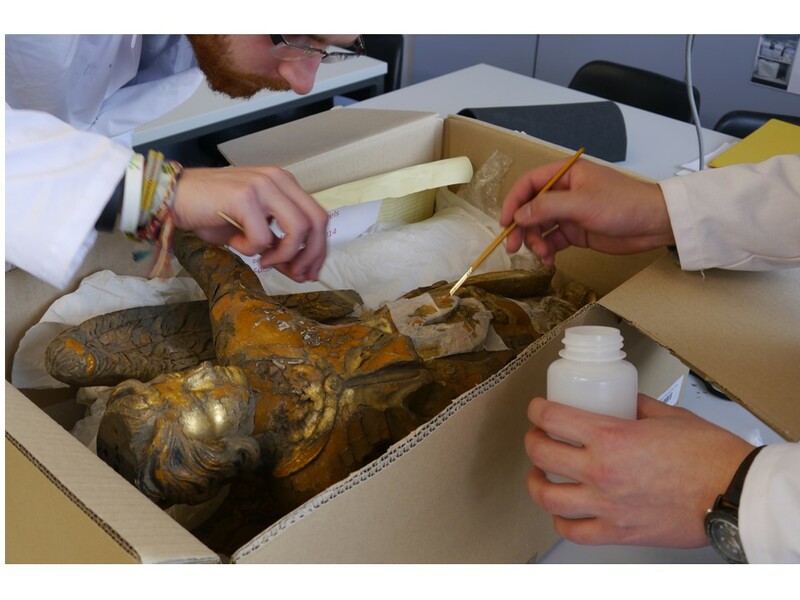 They have recently been entrusted to the UCL Institute of Archaeology Conservation Department, by Norfolk Museums Service, as they were in need of some tender care. In this first chapter of our series on this ongoing conservation project (run by fellow MSc. 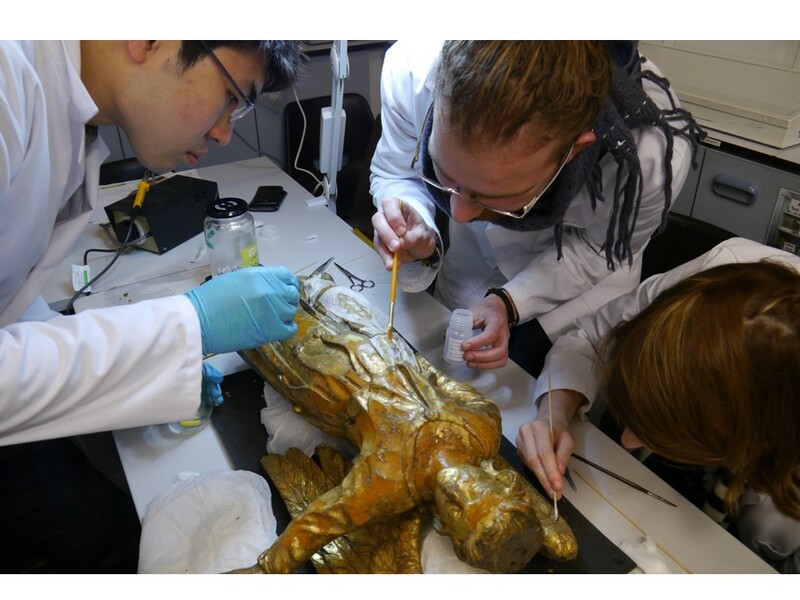 Conservation colleague Claire D’Izarny-Gargas at UCL Qatar and us students in London), we shall first describe the initial condition of the angels we have come to love here at the conservation lab. So, without further ado, let’s jump into the thick of it! The faces of both Angel A (left) and Angel B (right) had particularly suffered from surface delamination. Courtesy of Norfolk Museums Service, T1878333. Angel B was in much worse off a state than A – note the extent of flaking as well as the acuteness of the flaking (not to mention all the dust!). Courtesy of Norfolk Museums Service, T1878333. 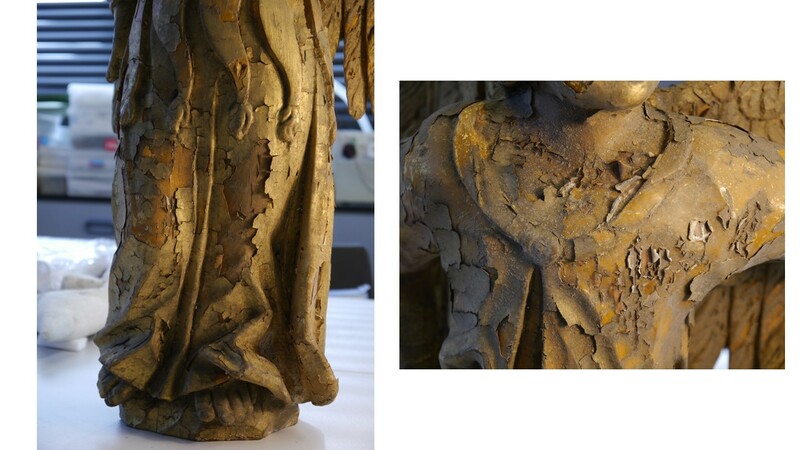 Whilst Angel B suffered on the front, Angel A had more severe problems on its back, where delamination had taken place to reveal the various gilding campaigns, painted layers and ground layers. Although rather despairing, the deterioration allowed insights into the preparation of the object during its creation. Courtesy of Norfolk Museums Service, T1878333. From these visual observations, it was clear that the sensory significance of the objects was being compromised and necessitated immediate recourse. This was also since both angels were missing fingers and Angel A in particular was suffering from a fractured arm! In the next chapter, join us as we report the analytic tests and research which were undertaken to further comprehend the active deterioration and finally guide the treatment choices for the angels. N.B. All photos by Claire D’Izarny-Gargas. Blitzing algae in a Roman villa!